What an auspicious theme as we begin the Season of Advent: Reflection! And what better place to reflect than in the desert? The photo above was taken while I was driving with another sister from Minnesota to California. It is from the part of the journey through the Salt Flats of Utah. A more desolate and eery landscape you could not find! And yet there is such beauty in the midst of it. Why Is It So Difficult for Us to Believe? says our God, who has mercy on you. 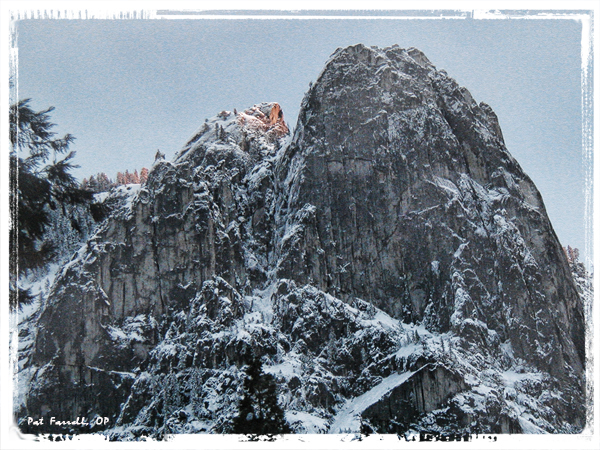 This snowy, seemingly immovable, granite mountain is in Yosemite. We can believe that the mountains can’t be moved, but we have difficulty believing that God’s love would never leave us. Let our Advent task be to find our hope in the love of God toward us, stronger and more faithful than anything we know. 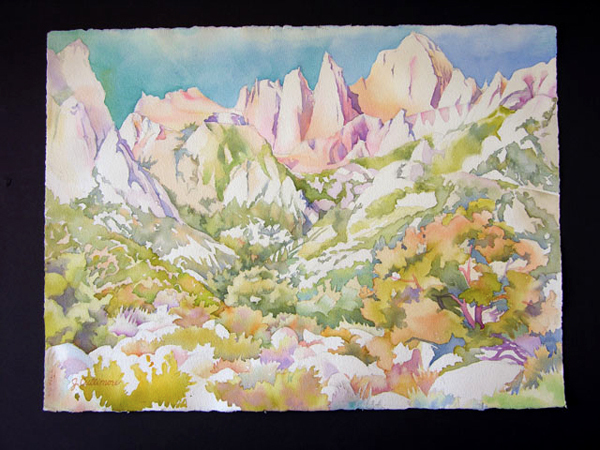 Sister Joanne Cullimore’s watercolor of Mt. Whitney, named Whitney Portal, speaks to our hearts as Isaiah does in today’s reading for the Second Wednesday of Advent. Waiting on God brings us strength . . . the strength of these granite mountains, created by our God. Lift up your eyes on high and see who has created these things. . .
. . .Do you not know or have you not heard? The Lord is the eternal God, creator of the ends of the earth. God does not faint nor grow weary, and God’s knowledge is beyond scrutiny. . .
God gives strength to the fainting; and for the weak makes vigor abound. 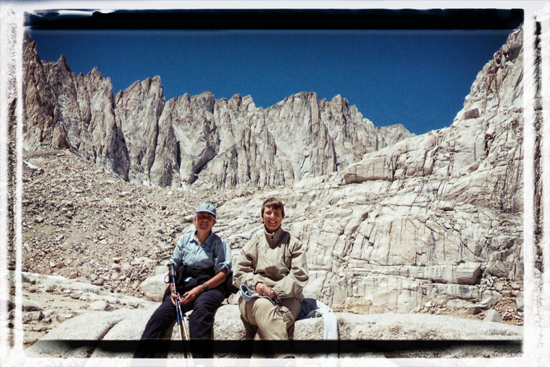 In the summer of 2003, Sister Abby Newton and I went on a trek with a friend (that I just saw recently), Carolyn Mucelli. Because of timing and other issues, we never made it quite to the tippity-top of Mt. Whitney, the highest peak in the 48 contiguous states. But we did hike the 99 switchbacks that took us to the crest of the Sierras, named Trail Crest, at 13,777 feet above sea level. The picture below shoes Abby and myself at Trail Camp with Mt. Whitney behind us. I love these Advent readings that we find this First Week of Advent. Today’s reading from Isaiah reminds me that there is something within us that creates a desire to climb the heights – to stretch ourselves. In our imagination, we put God at the top of the mountain, and then try to reach that summit where God lives. We forget, too often, that God lives within . . . within me and within you. It is great to get into the outdoors . . . into nature . . . and to hike within the beauty of creation. Our spirits soar. But to find God, the only mountains I need to climb are within myself. And, believe me, the switchbacks wind round and round! My prayer and hope this Advent is that we will find the courage and fortitude to continue on the journey of climbing the heights to find our God . . . who lives within. We may finally find ourselves there as well. And may we be kind to our companions on the journey. We never when they may find themselves in a difficult pass. Mt. Whitney behind Sisters Pat and Abby.